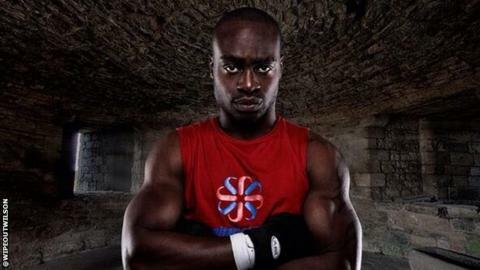 British boxer Jerome Wilson is in a critical condition in hospital after undergoing surgery on the head injury he suffered during his defeat by Serge Ambomo, according to his promoter. Coldwell Boxing stated on its Facebook page that a "life-saving brain operation" had been carried out on the the 29-year-old welterweight. Wilson was knocked down in round two and the fight was stopped in the sixth. The Sheffield fighter was treated at ringside and given oxygen. Ambomo reportedly knelt down over Wilson and kissed his head after delivering the knockout blow, unaware that his opponent was seriously hurt. The Cameroonian's trainer Glyn Rhodes then intervened and put Sheffield-based Wilson in the recovery position. London Olympian Ambomo, 28, who had previously beaten the Briton in May, later apologised. Before Friday's fight, Wilson had a record of eight wins and two losses since his professional debut in February 2010.